Fu jiying (English name: ELECTRA) is the founder of Chinese fu calligraphy and the first person of image calligraphy in the world. Song qingling image special actor. He is a first-class Chinese artist, vice President of the Chinese youth calligrapher's association, executive vice President of the central academy of calligraphy and painting, executive director of the international artists' association, member of the Chinese poetry society, honorary director of the art gallery fu jiying art world. China charity association love ambassador, red ambassador. Jingdezhen porcelain changnan kiln image spokesman. His works have won many international and national awards. In 2009, together with frank palmer, one of Germany's top photographers, he initiated the contemporary photographic calligraphy. It caused an international sensation and was known as the "Michael Jackson" of China. Yixing day soil, wu men out of the pottery. After ceramics, purple sand has become a national art. A surplus grasp, all the children in a cuddle, on the old dew against zhuang, the next bubble of the spring of Confucianism and Buddhism. Zen do not look at the world, a handful of purple sand release tianji. Yixing wu men, a hundred years of inheritance. Wu pottery calendar wu yuqing and wu men of the fifth generation of descendants of wu hailong, stage name ouyang haifeng. Precocious wisdom, young learn art with father at wu shi pottery art studio. Family style nurture, inherit from the next, do their best skills; Carry forward, push through the old and bring forth the new, then become a new generation of purple sand master. Master wu has been near the destiny, zisha artistic attainments consummate, art gradually "tianjue" the environment. 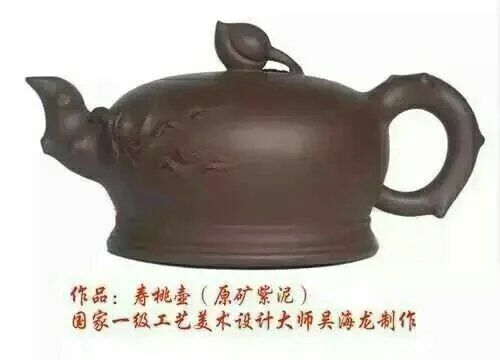 Its works are the inheritance of classical innovation, in the "light goods" type of exquisite appearance, exquisite contour, natural simplicity, simple and elegant; And in "flower goods" modelling on the division changes nature, carve knead model, technique is rich, have typical wu shi aesthetic style; In the shape of the rib apparatus, the rib sac has clear texture, appropriate density and freely depth. 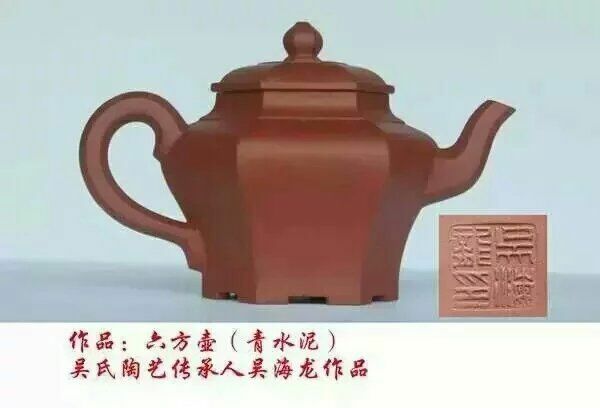 In the shape of girder pot, the style of ancient, pot body and girder, the contrast between the real and the imaginary is clear, the shape curve is smooth and clever, like the sound of running water, beauty washing yarn. Although wu master is famous far spread, but he is not tired by the popularity of the vulgar world, in his own wu pottery wu hailong purple sand art gallery fine art, life, art, purple sand kneading kneading in one. Although his works are difficult to find in the market, but he has a "good work does not show pu", meditation craftsman, carefully do art. With a title to summarize the master wu hailong, that is: purple sand lek nirvana, god has artifacts. In 1972, he studied and created purple sand ceramics with his father. In 1997, wu hailong purple sand art gallery was founded. In 2008, joined the association of purple sand association of jiangsu ceramics art. In 2013, he was invited and served as the director of China association for the promotion of international exchange. 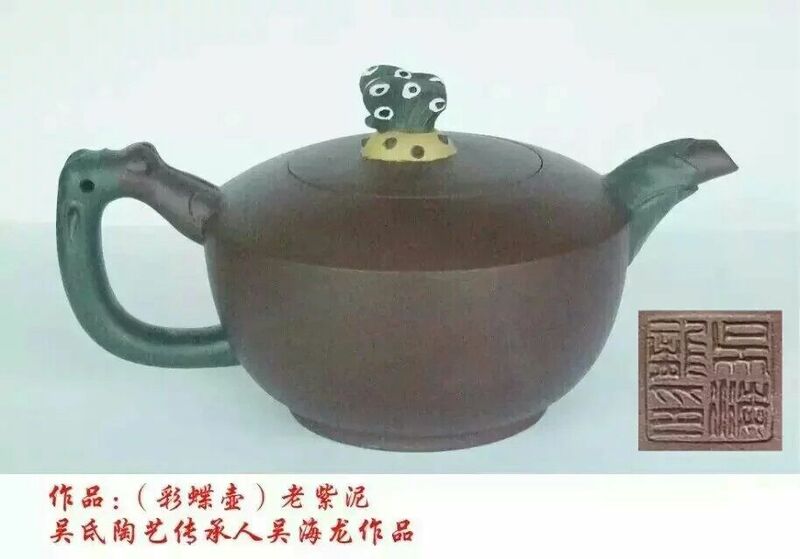 In 2013, he was awarded the title of Chinese purple sand pot design master by Chinese society for life sciences • national aesthetic education and cultural industry cooperation organization of ministry of education. In 2014, I was employed as a consultant of zisha association of jingmen city, hubei province. In 2014, after the examination and approval of the artist evaluation committee of the People's Republic of China, the artist's works have the qualification of national first-class artist. The artist is allowed to participate in the exhibition series of Chinese modern painting and calligraphy and the works of masters of arts and crafts, and the artist's works are recommended to enter the international art market. In 2014, his works of antique pot, hexagonal pot and garnet pot won the gold award in the first invitational exhibition of calligraphy and painting works of Chinese artists in the world. In 2014, he was employed as a member of the expert group of artists union of Beijing federation of the alumni association of wuxi calligraphy and art college. In 2015, he was awarded "outstanding contribution figure of the great rejuvenation of the Chinese nation", "outstanding artist of the Chinese nation" and "lifetime art consultant of China international modern art research center". Works included in the commemoration of the 70th anniversary of the victory of the war of resistance against Japanese aggression theme "China album". In 2016, he was selected into the yearbook of the People's Republic of China (volume 2016). In 2016, he was hired as vice President of qiushi painting and calligraphy institute, director of wu hailong purple sand working room of qiushi painting and calligraphy institute, and vice director of zhongnanhai art museum. 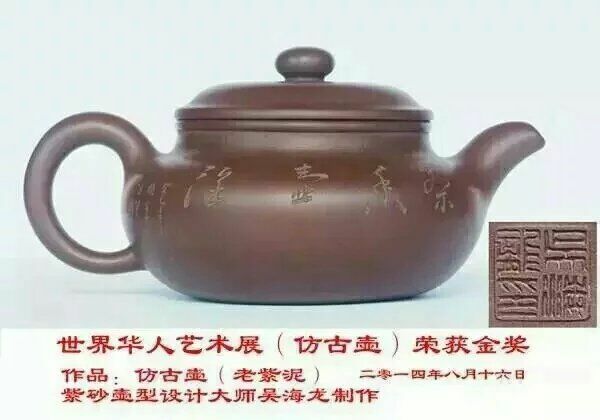 In 2016, the old purple clay pot "butterfly pot" was collected by the great hall of the people. 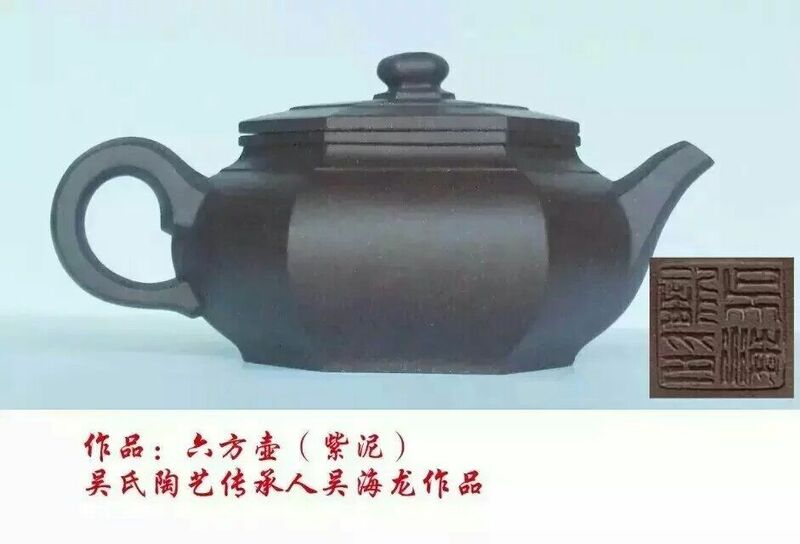 In 2016, it was awarded the title of "artist of China's national gift special gift" and "certificate of national gift special gift" after being evaluated by the national gift special gift art committee and the national gift cultural market committee. People and pot edge, pot and people edge, people edge. In 2017 xinghu garden spring party, fu jiying teacher as a lucky draw guests hand down the first one out of the audience is actually one thousand-thousand-one of the master wu hailong, when the master happy excitement on the stage, fu jiying teacher surprised said: ah, how do you come up the master laughed and said: I do not know ah! Then two people's hand tightly clenched together, the common sigh with emotion 1: fate! In the New Year of 2017, I wish the two giants a win-win cooperation! Let the perfect combination of poetry, calligraphy and painting zisha culture, let each other's artistic attainments create brilliant.